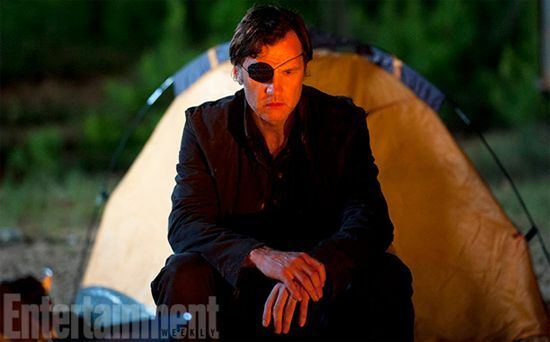 Returning to the failed attack on the prison, the Governor has set up camp and seems completely dead inside. With his town of Woodbury empty and burned, he sets out on his own and finds three women and an old man in an abandoned building after a long and lonely travel. The women try to interrogate him but he conceals his identity as Brian Harriet and chooses to speak very little. While searching the building, he comes across a walker in a bathtub, kills it, and finds a gun on the corpse. Finding a picture in his backpack of his family, he continues to wallow in his depression. Lily, one of the daughters, tries to give the Governor back his gun and some food, but he continues to be avoidant. She asks him about her father, suffering from lung cancer and desiring to keep him alive. Asking him to go to the old folks home, the Governor agrees to track down another oxygen tank to keep her father going. While he is able to avoid the old walkers before finding the oxygen tanks, a flood of them overtake the way out and he is forced to abandon all but two of the tanks. Returning to Lily and her family, Lily tries to clean the Governor up and tells him about Megan’s father and his disappearance. Leaving Megan in his care, the Governor struggles with the little girl’s questions about his eye but decides to reveal his story to her. He tells her that he was trying to protect someone. After cleaning himself up, this opens him up to spending time with the little girl by playing chess. They are interrupted by the passing of Megan’s grandfather, who immediately turns and forces the Governor to kill him in front of the girls. Now frightened by the Governor, Megan distances herself from him. Alone in his room, he burns the picture of his family and packs up his stuff. Telling Lily that he plans to leave, she pleads with him to let the three women tag along. He agrees and takes them in the truck. Still afraid of him, Megan keeps her distance while Lily and Tara continue to try to connect with him. Lily chooses to sleep with him that night. They find the truck is dead and set out on foot. 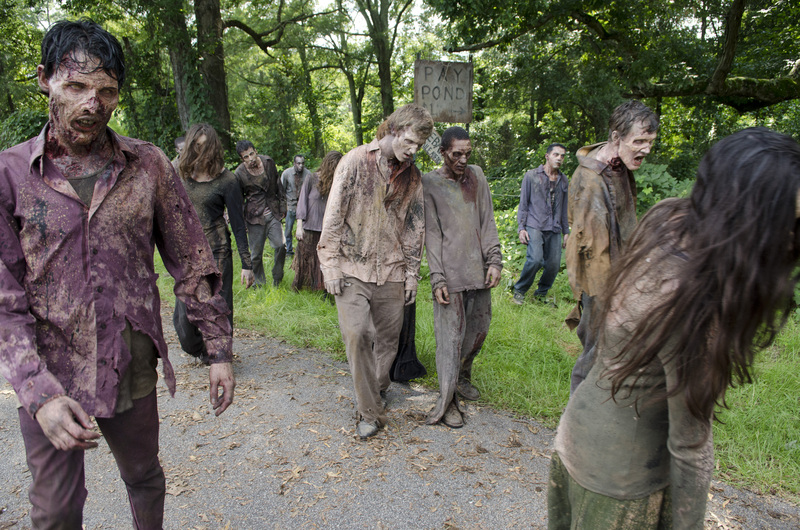 Coming face to face with a herd, Megan finally drops her fear of the Governor and races off into the wood with him. Tara struggles to keep up on a bad leg. The Governor and Megan fall into a ditch and he faces off against a few walkers. After the fight, he looks up and sees Martinez. Reaction: Taking a visit into the Governor’s story following the failed attacked, the episode featured David Morrissey moving from depression and hopelessness to something a little less deep in sadness. The Governor was clearly lost without a sense of purpose. He torched his town and tried to get rid of all of his past. Later in the episode, he finally tried to let go of his family’s grip on his life after the apocalypse. The idea of Woodbury was always important to him, but he was holding onto his zombified daughter because he wanted to save an element of his former life. After Michonne killed her and took his eye, he went into a focused rage for the period between the fight and his assault on the prison. The abandonment by Martinez and Shumpert forced him to be alone with himself and no one to focus his rage on any further. The new relationships with the women bring an interesting crossroads for the Governor. There is no way he can redeem himself for the actions at Woodbury and the assault on Rick and the prison, but he sees this situation as a possible new beginning. These women could be a chance to find love and caring again. They could also give him a reason to go on the offensive again as he tries to protect his new “family.” There is a clear sense that he will find himself back at the prison sometime around the end of the outbreak of the flu, so protecting the women might be his justification to attack Rick and the prison for a new safe haven. Or maybe he could justify in his head that Rick and Michonne are still threats. It is all really in the air at the moment. The episode is a bit of an odd one in the middle of this season, as it takes a sidestep from the events of Rick and the crew. The Governor is such an intriguing character, but he is just lost in thought through over half of the story. Outside of his mission for the oxygen tank, killing of Don, and fight in the pit, he was just dead inside. While this was an emotionally-driven storyline, it also required David to appear on Talking Dead in order to explain the inner working of the Governor’s frame of mind. With the preview focused on the Governor and Martinez and a new group of people, it looks like it will be another two weeks before we learn the fate of Rick, Glenn, Carol, and the rest of the prison.